Where to buy the book. With a sterling reputation and a string of A-list celebrity clients, private chefs Jewels and Jill Elmore have created unforgettable food for such luminaries as Jennifer Aniston, John Travolta, and Arnold Schwarzenegger. For the first time ever, Jewels and Jill reveal the secrets to their success both in business and at home with their own families—with more than 75 stunning, savory, and satisfying home-cooked recipes, fully illustrated with easy-to-follow directions. Using this book by two of America's most accomplished private chefs, readers can capture the magic and beauty of the best fresh, healthy, and nutritious cooking. 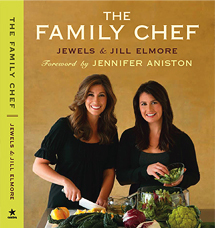 Jewels and Jill Elmore are sisters and acclaimed private home chefs. Synopsis by William Doyle is a New York Times bestselling author who has written or co-written eight books. In our line of work people call themselves “personal chefs” or “private chefs,” but those titles barely begin to capture all we do. We prefer Family Chef. As professional Family Chefs, we cook for our clients in their own homes and, in so doing, play an integral role in the families we serve. We are incredibly lucky to work for some of the most accomplished people in the entertainment world—powerful, strong, successful people who are defined by their positive energy, enthusiasm and achievement. Because we cook for them in their own kitchens, just as you cook for yourself and your family at home, we see the impact that the right food, made with the right energy, can have on people and their lives. We’ve found that cooking is a powerful way to pass that energy from one person to another. Which brings us to why we are writing this book. There is a secret about good cooking that we want to share with you. We put this secret into every course we make— whether we are serving a husband, next-door neighbor, studio chief, heads of state or two thousand people at the Governor’s Ball at the Academy Awards: Good cooking is not always about being the best chef; it’s about how you do it and the care you put into everything you serve. It’s about bringing out the Family Chef inside of you, a chef motivated by love and passion both for food and for the people you feed. In our work, we see how a beautiful, fresh meal, lovingly prepared, can bring a group of family and friends together and help them enjoy one another and celebrate life. We have used food as a silent form of nurturing and comfort when words were not sufficient. We have found that the right food, carefully chosen, can tantalize and awaken dormant senses. It can drastically improve a child’s behavior and give him a chance to succeed. Prepared intentionally, food can change the course of your day—and it can change your life. much emotion and love as music, dance or poetry. It can give you joy, hope and laughter and it can energize your soul and spirit. In short, cooking from your heart can be one of the most loving forms of expression. When you cook with conviction it can also save the day—or the night, as the case may be. It sure did the evening of the Moroccan party we once catered where how we cooked was just as important as what we cooked. evening, Jewels’ client had sent us over to a close friend’s home to help her throw an authentic Moroccan-themed dinner for about ten people. Guests arrived at the ocean-side home on a cliff, wearing Moroccan hats, robes and heavy jewelry. They found us cooking in an open kitchen, where they could observe everything we did. The first-course soup we served drew high praise, as did the salad. Aromatic lamb baking in individual pyramid-shaped tagines was just about done when we discovered that neither of us had turned on the flame under the pot of couscous. Everybody was watching. With so many eyes on us, we couldn’t show any panic. We needed to act like we always wait until ten minutes before the entrée is ready to start the couscous, which meant we needed another dish—immediately—to stall for time. Because the hostess had graciously cleaned out her kitchen to give us room, all we had were two blood oranges. That’s it, just two pieces of fruit. “A palate cleanser!” Jewels whispered. The more conservative and practical-minded of us two, Jill also knows when tostifle her panic and follow Jewels’ wacky lead. Off came the orange skins. We placed two paper-thin slices on each plate in an essence of grapeseed oil with coriander and crushed mint. Black cardamom pods added a dash of contrast as a garnish. Jill still wasn’t convinced, but Jewels believed. “I decided, this is going to be delicious and clean and it is going to work,” she remembers. She added a touch of rose water and we hoisted the plates over our heads theatrically to serve the expectant room. The guests loved it! They were over the moon. They’d never tasted anything like it (and neither had we). By then, the couscous was done and we were serving up the main course. It’s amazing we got anything else done that evening, we were so busy congratulating each other under our breath. At moments like those, yes, our experience comes into play. But it’s the spirit with which we imbue the food we serve that wins over hearts and stomachs. We firmly believe that while you don’t have to be the best chef in the room, you do have to care. The feelings of the hostess, the reputation of our client and the life of the party were at stake that night—all saved by a little passion and conviction. It seems only natural that we grew up to feed other people for a living. It’s in our blood. Our grandmother, our nana, who was raised in New Mexico, learned to cook under extraordinary circumstances. When she was just four, her mother died. The youngest of eleven, she lost four of her siblings when they were still kids, an unimaginably high toll for one family even back then. She and her siblings raised one another with the help of their father, who was blind. In the kitchen our great-grandfather would stand at the counter and ask his children to bring him flour, salt and other ingredients. He used his sense of touch to mix them together in just the right proportions to make tortillas. Our grandmother learned to do the same, never using measuring cups or spoons. When she was teaching us how to make tortillas as kids, she would plunge her hands into the dry mixture and tell us, “It needs more baking powder.” We would look at each other in amazement. Because we grew up cooking next to her, we feel—as she did—that recipes are just guides. Much of what we do today is by intuition and experimentation. Nana was just fourteen when she moved with some of her sisters to Los Angeles and took a job as a housekeeper, nanny and cook for a Jewish family. Wonderful Molly and Simon Ruben introduced her to a new world of food. They taught her how to buy the best cuts of meat from the butcher and to make sure that butcher became a friend. They really took her in as a member of the family. We met the Rubens several times as kids; Nana stayed in touch with them until they passed away. Between her background as a descendant of immigrants from the Mexican state of Chihuahua and her many years with the Rubens, Nana could make just about anything. We were especially fortunate that our grandparents always lived with us. Our nana was the Queen Mother, or as we say, the Doña, of our vast, extended family. She married our grandfather, Salvador, who had eleven siblings of his own. There are so many cousins out there, we can’t keep track of them all! At family reunions, it takes bleachers to hold us for the family photograph. Our grandfather, our papa, could almost cook as well as Nana. Super-fit and superactive up until he died in his eighties, he delighted in dishes like fried frog legs, rabbit and really, really hard aged cheeses that gave off powerful aromas. He had his own specialties, like costillitas, little lamb riblets that he would fry up outside in a skillet on a hot plate while the women cooked indoors. As kids, we would wait in anticipation for them to be ready. They were so delicious!